Wet Trout: Day 7: Nashville, TN: Free Day! Skylar stayed up very late last night eating pork ribs..I think we have a convert. Wait til she tries brisket from Texas. We woke up first thing (around 930) and headed to free breakfast then packed up to leave since we'd only booked the room through Monday. Our plan was to head to nearby Franklin and check out some plantations and catch a room wherever we ended up. As we rolled our bags to the car it struck me that we should at least ask if we had another night so Skylar went back into the lobby and well, what do you know...we were already booked in and paid for until Tuesday. Doh! Skylar and I together make about half a brain (on a good day). We dragged our bags and butts back to a new room because our old one was...well...less than desirable. We were across from the women's bathroom and the hotel laundry room. Starting at 5:00 AM all I could hear were doors shutting over and over. And then there was the roach sighting. 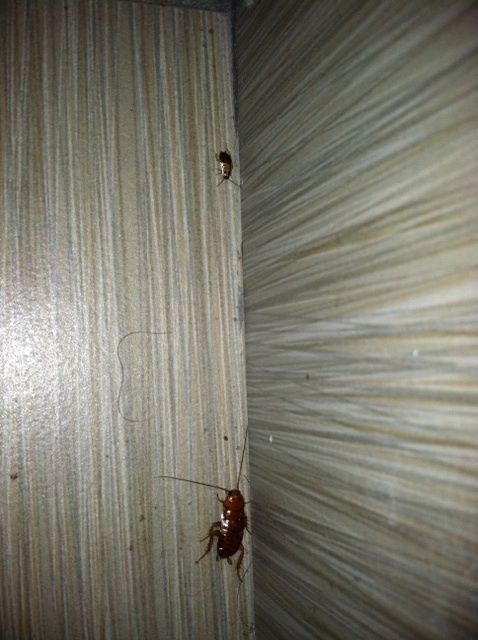 A big roach and her offspring were hanging out in the bathroom...thanks, Holiday Inn! Skylar and I hit the highway and headed toward Franklin where we did some serious ghost hunting (well, I did, Skylar doesn't believe in ghosts, despite the fact that one follows her everywhere...boo!). We arrived at Carnton Plantation and bought some cool bonnets like Laura Ingalls wore (and if you don't know who that is, you are too young to be looking at photos of pubic hair) and walked through the garden and the cemetery. The cemetery was NOT by any means as impressive as those in Ireland or Scotland...but I guess the point isn't to make a cemetery that will impress but one that will bring peace. We ate lunch at a Cajun place and walked around Franklin where we found a radical bed for...wait for it...$7,000. Ok, so I won't be buying that anytime soon or ever. Franklin is a nice town with a lot of Civil War history. About every block has a field fenced off where a battle took place. I wish I were a history buff, I'd be loving it. Unfortunately, I'm simply a food buff and instead I'm eating my way through town. Right before we donned our suits to hit the pool and lounge around the rain started pouring so our last night in Tennessee was spent in the room. But oh how great it was to feel warm rain! This post made me chuckle. Even the cockroaches, which I have never seen in person and I don't think I want to any time soon. And.......I am old enough to know what a laura Ingalls bonnet is, although I don't know if that is good or bad, lol. 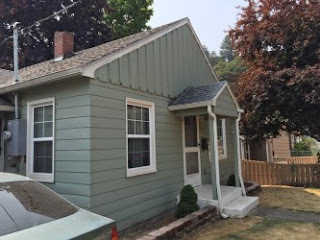 Welcome back to Oregon, it rained just for you. Although I hear it will be sunny by the weekend. You can always go riding, it will soothe you. Life is way too short!!! Enjoy what you can, when you can! And always let the dog sleep between the sheets spooning you...true unconditional love in my book!!! !